For the wisdom, bravery, and leadership that made her a hero during the first Gulf War, accelerated her advancement at Kuwait Oil Company and led to her cofounding in 2005 as its CEO of Kuwait Energy Company which has developed into a successful multinational, independent Oil and Gas Exploration and Production Company while establishing her as a role model and leader in the Oil and Gas industry and an embodiment of the type of person that Charles Rand would have recognized himself. 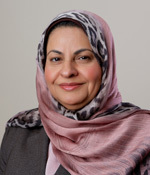 Sara H. Akbar, CEO at Kuwait Energy in Salmiyah, Kuwait, began her career in 1981 as a petroleum engineer at Kuwait Oil Company. She subsequently worked there in fire-fighting operations, as superintendent of petroleum engineering, and as R&D specialist. From 2001 to 2005, she served as new business development manager at Kuwait Foreign Petroleum Exploration Company. Akbar received the SPE Distinguished Member Award in 2003. In 1993, she received the United Nations Global 500 Award, and this year she received the WOW Awards–Entrepreneurship Award from the New Arab Woman Forum. Akbar has served twice as a director-at-large on the SPE International Board of Directors. She has authored and delivered several technical papers, served as presenter and speaker at many international conferences and taught at various schools in Kuwait and abroad. Akbar earned a BS degree in chemical engineering and completed several training courses in petroleum engineering—all at Kuwait University.